Step 1 Heat the oven to 350 degrees. Step 2 Cut the squash in half lengthwise and scoop out the seeds. Cut each half in half again so you have 8 pieces. Arrange the squash in a 9-by-12 baking dish skin-side up and add 1/2 cup of water. Cover tightly with foil and bake until the squash can be easily pierced with a knife or carving fork, 45 to 50 minutes. Step 3While the squash is roasting, pulse together the butter and the hazelnuts in a food processor to make a rough paste, almost like a soft cookie dough. Add the liqueur and pulse again to mix it in. Step 4When the squash is soft, remove it from the oven and increase the temperature to 450 degrees. Step 5Drain the water from the baking dish and invert the squash so that it is skin-side down. Salt it lightly, then divide the hazelnut butter evenly among the squash pieces, spooning it into the cavity. It will take a bit more than a tablespoon per piece. Step 6Return the squash to the oven and bake until the tops are lightly browned, about 15 minutes. In Recipes-list.com we have selected the most viewed recipes from category - Vegetables Vegetarian . Enjoy the best recipes specially selected for you! 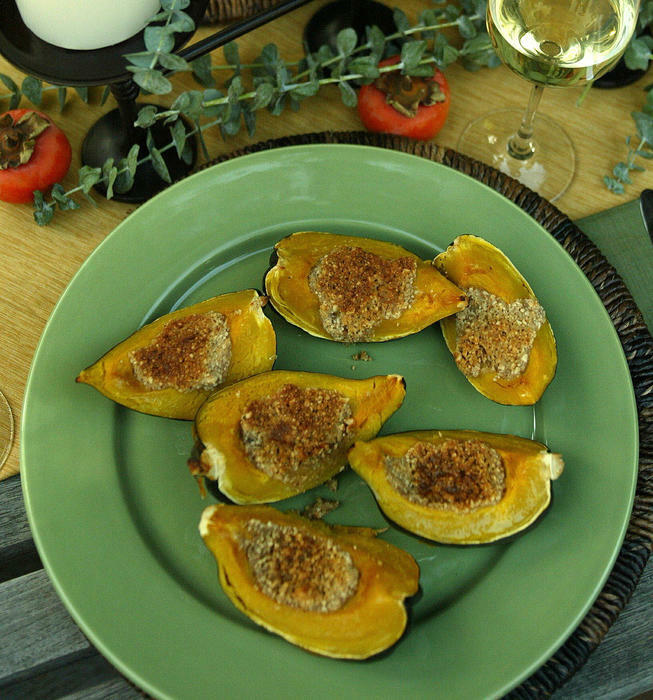 Acorn squash with hazelnut butter is the right choice that will satisfy all your claims.